For centuries, the lute was considered the “prince of instruments,” and lute players were celebrities in royal courts across Europe. Ayreheart, a progressive folk trio founded by lutenist Ronn McFarlane, seeks to restore the instrument to its former glory – but in a modern context. During the Renaissance and Baroque eras, lute players were songwriters and pop stars who weren’t afraid to improvise. The three members of Ayreheart – McFarlane on lute, Will Morris on fretless bass, violin and colascione, and Mattias Rucht on percussion – all have backgrounds in rock and jazz, which comes through in their energetic performances. McFarlane writes original music for Ayreheart that dispels previous conceptions of the lute’s limitations. McFarlane’s compositions draw influence from Celtic music, American folk, jazz, and bluegrass, making a case for the lute as a versatile instrument worth incorporating into modern popular music. With Ayreheart, McFarlane is reinventing the lute, giving the instrument its own renaissance, and bringing it to contemporary audiences with eclectic tastes. 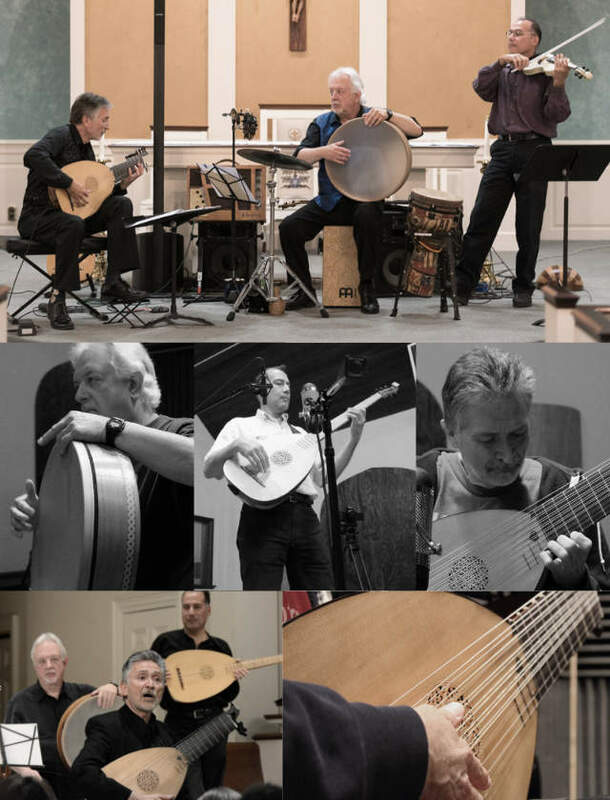 Ayreheart also performs all-Renaissance music concerts, creating arrangements enlightened in historical music making while joyously relating to real living people. Here is music that is born of what has come but leads us into where we can go: old forms born anew and ever fresh. GRAMMY-nominated lutenist, Ronn McFarlane strives to bring the lute - the most popular instrument of the Renaissance - into today’s musical mainstream and make it accessible to a wider audience. At thirteen, upon hearing “Wipeout” by the Surfaris, he fell wildly in love with music and taught himself to play on a "cranky sixteen-dollar steel-string guitar.” Ronn kept at it, playing blues and rock music on the electric guitar while studying classical guitar. He graduated with honors from Shenandoah Conservatory and continued guitar studies at Peabody Conservatory before turning his full attention and energy to the lute in 1978. The following year, Mr. McFarlane began to perform solo recitals on the lute and became a member of the Baltimore Consort. Since then, he has toured throughout the United States, Canada and Europe with the Baltimore Consort and as a soloist. McFarlane was a faculty member of the Peabody Conservatory from 1984 to 1995, teaching lute and lute-related subjects. In 1996, Mr. McFarlane was awarded an honorary Doctorate of Music from Shenandoah Conservatory for his achievements in bringing the lute and its music to the world. He has over 35 recordings on the Dorian/Sono Luminus label, including solo albums, lute duets, flute & lute duets, lute songs, recordings with the Baltimore Consort, the complete lute music of Vivaldi, and Blame Not My Lute, a collection of Elizabethan lute music and poetry, with spoken word by Robert Aubry Davis. Recently, Ronn has been engaged in composing new music for the lute, building on the tradition of the lutenist/composers of past centuries. His original compositions are the focus of his solo CD, Indigo Road, which received a GRAMMY Award Nomination for Best Classical Crossover Album. Mattias Rucht has been immersed in music his entire life. His father was a symphony conductor and his mother was a pianist. His first playground was in the midst of the orchestra and behind the stage. He started playing the drum-set at the age of twelve and began playing in southern rock bands at the age of fifteen. By college, he had advanced to jazz fusion. Mattias has been involved in multimedia development for many years. He has composed music for animation, games, film & video and has had a computer based studio since 1984. At one point, all the instruments that he used were MIDI and electronic. Around 2002, Mattias started listening to some of the masters of world percussion and what they were doing with acoustic instruments. A simple tambourine or djembe could be more expressive than a rack of electronic instruments. This sparked his interest in world percussion and getting back to basics. Since then, he has discovered the joy of ethnic percussion and world music, bringing a wide range of influences to his playing style. Mattias Rucht has been active in the Washington DC music scene for over 25 years as a drummer/percussionist, playing in various rock, jazz, folk and world ensembles. He has also performed in theatrical productions and accompanied dancers and storytellers. If you rose into high school with a desire to keep your hard won violin skills as an active part of your academic life but found no options for strings, what would you do? I found myself in just this situation. Looking through the list of music class options available, jazz band was the only class in which I could play a string instrument, the bass. But I’d never played bass. And I had no real experience playing traditional jazz either. What to do? I got it stuck in my mind that I’d take up the bass and take that class, but the jazz band members are the top players of the school and new students had to audition to take the class. How could I possibly make the cut in a music style I’d no experience with, on an instrument I’d never played before with barely two months to prepare? I borrowed a neighbor’s amplifier and rented an electric bass that summer and by my determination, taught myself to read the bass clef and relate it to playing the bass. The bass strings are the familiar E, A, D and G tuned in intervals of fourths, the reverse order to the violin’s fifths I’d grown up with - it was like entering a weird backwards world. Spending hours a day with the bass and growing accustomed to the new order of finger placements that present themselves by playing arpeggios and scales, it was easy to see the predictable patterns that naturally occur. Besides learning the mechanics of the bass, I gave myself a deep immersion into improvisation by playing along with with the radio, anything that would be broadcast - jazz, rock, funk, country, without reservation or judgement of the music, just playing along because I so desperately needed experience. This was the birth of my bass life. I could’ve been easily cut from jazz band by the well established seniors, but I managed to pass audition just well enough to keep a position in the class. I practiced everyday, taking home all the charts that were in our folders and playing through on my own as my daily, self-assigned, homework. It wasn’t easy, there were some very difficult professional level charts. Sometimes with written out bass parts sometimes just chord symbols, sometimes a mixture of both. I’d enjoyed listening to jazz as young kid but only had classical music as my way into music making, so that freshman year was how jazz was cultivated into my musical life. In subsequent years, I’d play with other friends and form rock bands as was common for kids at the time. All good education albeit in nontraditional form. Throughout high school, I continued formal violin studies and was fortunate to have found an instructor whose philosophy of music teaching was to give the student all the means needed for the student to learn for themselves. When I first started lessons with him, he actually told me that his job was to obsolete himself. That was amazing to me. It was this rare gift that has given so much to me, not just in music, but in many aspects of life. By way of this, I simultaneously learned to play mandolin, piano, guitar, saxaphone, flute and banjo in my teen years. It wasn’t long before I brought my newly found jazz improvisation to the violin and developed a flair for nonclassical music styles on an otherwise very classic instrument. At the time it was uncommon and didn’t have a easy place to fit in, so playing bass provided many more money making gigs than did the violin but playing the classics remained a staple of my life, even if by myself in the solo sonatas and partitas by J.S.Bach. While pursuing electronics engineering during college, I was determined not to let my music education go dormant. I’d read books, talked with other music professionals and asked many questions, read more books and was knowledgeable enough to tutor my music major peers in their theory classes. But the greatest music education was gained by my desire to compose. It was through this exercise that I learned the most about the crafting of music. Performing and recording with a wide variety of music acts over the years had shaped my take on music, and bass playing in particular, into a well suited match to accompany Ronn McFarlane’s modern lute music. When asked if I could take up the colascione to enable Ayreheart’s performance of early music, as well as acoustic versions of McFarlane’s contemporary music for lute, I blindly embraced the opportunity even though I’d never played a colascione before. Even though its similar to playing a standard bass, the nuance of making music with it is quite different. I’ve enjoyed this most recent addition to my quiver of instruments ever since.